Squeeze the juice from 1 lemon and add it to a bowl of cold water. Working with one artichoke at a time, snap off the dark-colored leaves to uncover the inner, pale-green leaves. Cut off the quarter tip of each artichoke, and peel and trim the bottom and stem, making sure to peel off all the stringy bits from the stem (baby artichokes do not have developed chokes, so you will not need to remove). Drop artichokes in the lemon water. 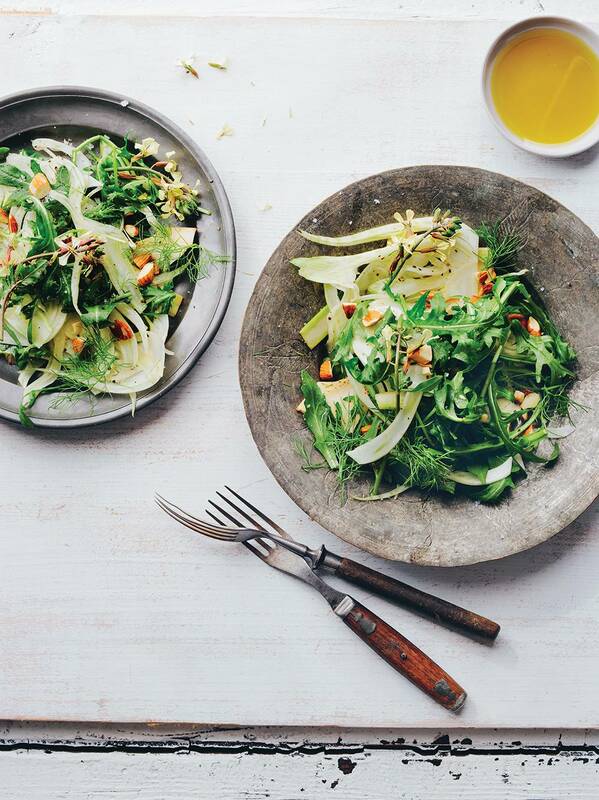 Shave the fennel and then the artichokes with a mandolin or slice thinly with a knife. Place in a medium bowl and toss immediately with juice from half of a lemon. Combine oils and drizzle over the sliced vegetables. Season to taste with salt and freshly cracked pepper, and toss to coat. Prior to serving, toss in the arugula, mint and almonds, and season to taste. For more acidity, use juice from the remaining lemon half. Portion on to plates and serve immediately. Makes 4 servings at 1.87 mg THC per serving.